Opossums are very clumsy eaters, so you can be sure that if you see sloppy meal sites by your garbage cans or at a pet food bowl, it is most likely this type of marsupial. These scruffy, rat-like animals have a bare nose and a rat-like tail with dirty-white fur. As mentioned before, opossums are marsupials and they carry their young in a pocket until they are ready to be on their own. They love to burrow and can often be found under decks, in crawl spaces, and in sheds. They often cause quite a bit of damage to foundations. 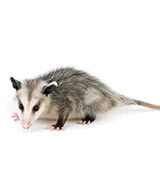 If you suspect an opossum has taken up residence in your home, it is best to call for a professional. Do not try to approach any wild animal, as they often carry diseases that are harmful to humans. When the technician arrives, they will be able to humanely trap and relocate the opossum. After the little critter is relocated, the technician will be able to assess the damage to your home and perform any necessary clean up and repair to prevent any reoccurring occupations in the future. From identification, capture and relocation, to clean up and repair, our professionals have got you covered.